HIGH POINT, North Carolina (WTVD) -- A new poll from High Point University says that less than half of North Carolinians report they've gotten a flu shot this year. 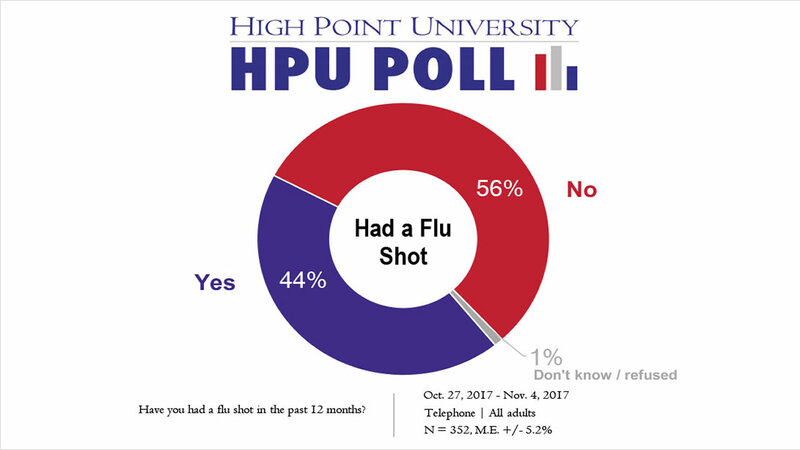 "In North Carolina, we still have some work to do with educating our residents about the importance of getting the flu vaccine each year," said Dr. Joy Greene, professor of pharmacy in HPU's Fred Wilson School of Pharmacy. "During the 2015-2016 flu season, the CDC estimated that 310,000 people were hospitalized for flu-related illness. Some of these hospitalizations may have been prevented if more people would have received their flu vaccine." Asked if they've had a flu shot in the last 12 months, 56 percent said no and 44 percent said yes. The survey was done between Oct. 27 and Nov. 4 with a margin of error of +/- 5.2 percent. The poll also looked at attitudes and beliefs about health overall in the state. The numbers show residents are split over whether they believe adults are healthier today than 20 years ago. Of that same sample, a majority say they have a somewhat healthy lifestyle. Details from the survey are available at: http://www.highpoint.edu/src/files/2017/11/54memoA.pdf.